Slowly bring yourself back down to reality, accept what is going on in your life, live in the Now and enjoy every moment... whatever it may hold. Life is as it is, and we are as we are. In each life and each us, there is beauty and love... and endless possibilities and limitless potential. There is peace, joy and love surrounding us at all times, we just have to open our eyes to it. There is no right or wrong. They are subjective and each person has their own right and wrongs for them. Surprisingly, a very good movie. At first, I thought it was a bit strange and was unsure of why I chose to watch it... but once the movie carried on, I was drawn in. The story line, all though a sad situation, was inspirational and uplifting and humbling. I also truly enjoyed the references throughout the movie that illustrate how, even though we do not see it, we all effect other people's lives. Just our presence in them, can change the lives of others. As small as making them smile - or find a dollar on the floor because we stalled them for a few minutes - to saving their lives by keeping them busy long enough to avoid a car crash a few moments before they reach that intersection. We are all interconnected. Overall - I recommend this movie to all!!! It's a nice way to slowly be brought back down to reality, to accept what is going on in your life, to live in the Now, and enjoy every moment... whatever it may hold. Life is as it is, and we are as we are. In each life and each us, there is beauty and love... and endless possibilities and limitless potential. There is peace, joy and love surrounding us at all times, we just have to open our eyes to it. There is no right or wrong. They are subjective and each person has their own right and wrongs for them. 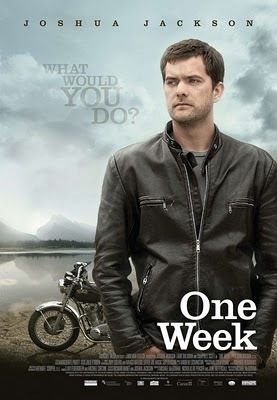 One Week is an independent Canadian film that delivers big insights in to living, loving, and leaving. Director and writer Michael McGowan definitely delivered a film to consider with the movie One Week. The film follows Ben Tyler as he is diagnosed with terminal cancer. Ben realizes that he has not lived the life he had imagined, and instead of always swinging for the fences, he has played it safe. Swinging for the fences is a baseball analogy that to be a home run hitter one has to put everything into every swing, even though it will usually end up in a strike out. This is not a baseball movie though and instead is a first rate road trip self discovery film. Joshua Jackson puts in a brilliant performance as Ben Tyler. Liane Balabon plays Samantha, and while she puts in a good effort, the character is not given a great deal of depth other than what is seen through Ben’s eyes. Campbell Scott is the narrator who becomes like a familiar friend on this journey of self awareness. Once Ben finds out he has terminal cancer, he decides that he needs to have an adventure before resigning himself to be a patient. His fiancée, Samantha, wants him to get in for treatment and cannot understand his need to go on a two day road trip to be alone. She understands even less his decision to buy a vintage Norton motorcycle. As an actuary, all she sees in life is the downside of risk. So Ben hits the open road with his Norton, spurred on by a Tim Horton’s coffee cup that directed him to head west. After a moment of doubt, Ben decides to continue westward and see where the adventure takes him. Two days turn into one week as Ben discovers life across western Canada. The characters he meets are of course the catalyst for him to reassess his life choices, and discover the sense of adventure he lost growing up. Part of the whimsical innocence is regained by his search for Grumps, a mythical creature of his childhood. Ben also questions whether he proposed to Samantha out of a sense of love or conformity. He realizes that many of the limitations he accepted about himself were not based on concrete reality. Answers to his life are found along the way as Ben packs a life’s adventure into one week. Ben ends his search in the ocean on the west coast of Vancouver Island. Part of the beauty in this film is the use of Canada’s diverse scenery. Going from lake country to prairies to mountains and ocean, this is a movie to make Canadian’s proud of the beautiful land they live in. Although a few of the elements will only make sense to Canadians, this is a film that has universal appeal. The viewer is drawn into Ben’s life, and there is an accessible nature to his character. This is not a movie about heroes and villains; as true life is not that black and white. The movie also sneaks in the little side stories of how Ben’s choices and presence cause ripples in the destiny of others. This interconnectedness to life is nicely woven into the story. To compliment the rich cinematography, the soundtrack has an eclectic but overall haunting quality.